Forest industry performance in May and June was reported by both the US government and the Institute for Supply Management. Total industrial production (IP) decreased 0.4 percent in May, erasing most of April’s 0.6 percent gain. Manufacturing output moved down 0.4 percent, led by motor vehicles and parts; Wood Products also contributed with a 1.3 percent drop. Total IP in May was 1.4 percent below its year-earlier level; at nine months of YoY decreases, this is the longest streak in modern US history of IP weakness outside of a confirmed recession. The US factory sector has been hit hard by the strong dollar, weak global growth and low commodity prices. Worse, there is no indication the downturn is over; per-capita electrical power consumption (a common gauge of actual economic conditions) in May was down 6 percent compared to May 2012. 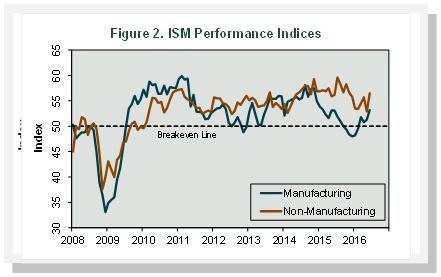 Contrary to the Fed’s IP data, the Institute for Supply Management’s (ISM) survey showed that US manufacturing's pace of expansion quickened during June (Figure 2). The PMI rose by 1.9 percentage points, to 53.2 percent. (50 percent is the breakpoint between contraction and expansion.) With the exception of input prices, all sub-index values were higher in June than in May (Table 4). Wood Products was unchanged while Paper Products expanded. The pace of growth in the non-manufacturing sector also accelerated in June, jumping to 56.6 percent (+3.6 percentage points). The only sub-indexes with lower June values were input prices and order backlogs. 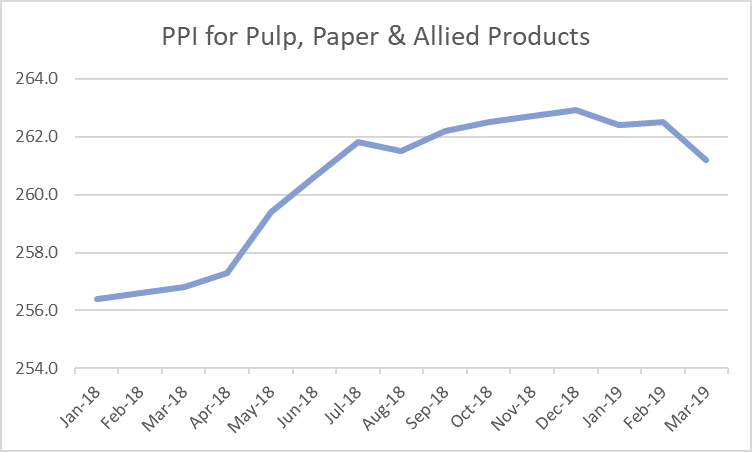 The consumer price index (CPI) increased 0.2 percent in May, reflecting rising prices for energy (gasoline: +2.3 percent) and all items less food and energy. Over the last 12 months, the all-items index rose 1.0 percent (rent: +3.8 percent —the strongest YoY rate of increase since 2008; medical care: +3.5 percent).